OAKLAND, California, Dec 7 2012 (IPS) - Better known as drones, Unmanned Aerial Vehicles piloted by military in the U.S. hunt and kill suspected enemy combatants abroad. Now the drones are coming home to beef up local law enforcement. But people across the U.S. are pushing back, contending that domestic drones could invade personal privacy or chill free speech by monitoring political activities. “They want to use it for intelligence gathering – that’s spying,” Linda Lye of the Northern California American Civil Liberties Union told media at a hastily called press conference Dec. 4 outside the Alameda County administration building in downtown Oakland. That morning, the Alameda County sheriff’s request for the Alameda County Board of Supervisors’ acceptance of Homeland Security grant funds for a drone was almost buried in a 66-item meeting agenda. But when the Northern California ACLU – a member of Alameda County Against Drones – learned of the sheriff’s request, they called the press conference to expose a process they said ignored the community. The sheriff subsequently removed his request from the agenda. And so, rather than a cursory board review, the supervisors’ Public Protection Committee will hold a comprehensive discussion on the drone question in January. On the federal level, Congress is beginning to address the question. The Preserving Freedom from Unwarranted Surveillance Act of 2012 was introduced in both houses of congress in June. If passed, it will require law enforcement to obtain a warrant before using drones for domestic surveillance. And the Preserving American Privacy Act of 2012, introduced in the House, would allow law enforcement to conduct drone surveillance with a warrant, but only to investigate felonies. The president signed a bill in February mandating the Federal Aviation Authority fully integrate drones into the airspace by 2015. The agency issued preliminary rules that allow public safety agencies to operate unmanned aircraft weighing 4.4 pounds or less as long as they fly in daylight, fly less than 400 feet above the ground and within the line of sight of the operator. But Senator Edward Markey of Massachusetts criticised the FAA in a Nov. 29 press statement, saying the agency has a “blind spot” when it comes to privacy issues in its oversight of domestic drones. He urged the FAA to respond to questions he’s previously asked about how the agency would notify the public about where and when drones are used, who can operate them, what data can be collected and how the information would be used and stored. Speakers at the press conference pointed to special circumstances in Oakland that call for protection against law enforcement abuse. “When we see in the (sheriff’s Jul. 20 application to Homeland Security) that the drones could be used for large crowd control, naturally everybody thinks of Occupy Oakland,” said Trevor Timm of the Electronic Frontier Foundation, referring to alleged police abuse of Occupy activists. The Alameda County Sheriff’s Department is just one of many law enforcement agencies across the country lining up for free money for drones from Homeland Security. They often point to popular uses for the technology, such as searching for missing children or escaped convicts. But those concerned with privacy issues note that the technology allows drones to peer through walls and ceilings, monitor cell phone calls and texts, read license plates, recognise faces and record a person’s every move. Some domestic drones, like the ShadowHawk acquired by Monterey, Texas, are able to carry “less lethal” weapons, such as tear gas and rubber bullets. As the Afghanistan war winds down, the defence industry is intensifying its push for domestic drones, which Susan Aluise, writing in investorplace.com, calls the “next market opportunity”. Dickerson estimates the industry’s value over the next decade at 70.9 billion dollars, with the civilian market worth 600 million to one billion dollars. The industry is fueled by a 60-person congressional Unmanned Systems Caucus whose members have pocketed some eight million dollars in drone-related campaign contributions over the past four years, according to a Hearst Newspaper and Center for Responsive Politics investigation. Citizens concerned with drone misuse are lobbying local officials. Buffalo, New York and Portland, Oregon activists want their city governments to ban drones entirely from airspace above the city. 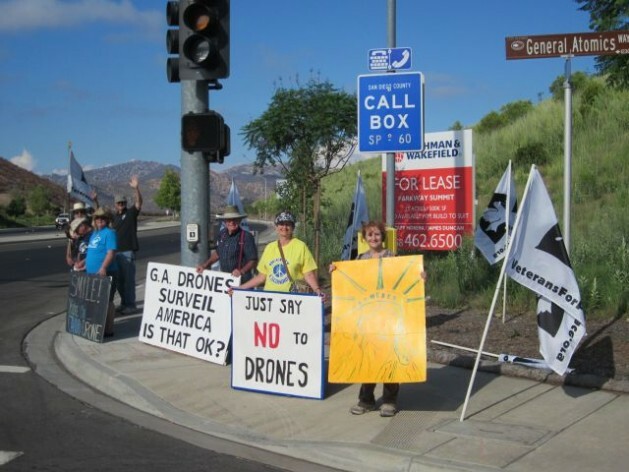 San Diego Veterans for Peace and their allies take their protest each Thursday to a busy corner near General Atomics, the manufacturer of Predator and Reaper drones. Like Alameda County, Buffalo, Syracuse, Portland and San Diego don’t have drones. Seattle does – but they’re not deployed, except for training missions. Like activists in Alameda County, Seattle residents were unaware when Seattle police initially pursued a Homeland Security grant for the drones. They also were unaware of their delivery in 2010. The Seattle City Council and community learned of the drones in April of this year, when the Electronic Frontier Foundation uncovered the 82,500-dollar acquisition through a freedom of information request. Police insist they did not keep the drones a secret, but concede they could have kept the public better informed. In a recent phone interview with IPS, Seattle City Council President Sally Clark said if she had discretion over the grant funds, she’d opt to spend the money on city priorities, such as paying for an additional police officer. Seattle’s Public Safety Committee will take up drone regulation in January. Harrell told IPS he’d like the law to restrict use of the drone to monitoring specific individuals named in a warrant, rather than allowing general surveillance. He said he’d like the law to require an officer with the rank of sergeant or above to authorise drone missions, and he wants public logs kept for each drone deployment. When local elected officials are afraid to antagonize “their own” police, whether by denying them new toys, extra powers, staff increases, or budget increases, it’s clearly the tail wagging the dog. Can you say “Praetorian Guard”?